Painting and interview by Tristen Shevey. a collaboration with UWM – Notable Neighbors* Della Wells is a Milwaukee born, self-taught artist. She was brought to Riverwest by a friend who had a building available. Living and making art in Riverwest is valuable to Ms. Wells, and she is well known and respected in the area. Although she is a late blooming artist, she has created a successful career depicting African American woman realizing the potential of their hopes and dreams. In Milwaukee’s Peltz Gallery, an antique caged in elevator leads up to a wide open space with several pockets. In one of the pockets is the preferred private studio where the creative juices of Della Wells flow. In her studio are several types of materials she uses to create her art, which are bought, gathered from the street, or given to her from her niece and family. Some materials include newspaper clippings, found objects, and paper. She creates paintings, drawings and quilts, but her main area of focus is collage work. A few of her collage pieces include Flora’s Groove, Candied Sisters, and I Don’t Care Mr. Bridges Is Not Gonna Stop Me From Doing My Sonj. There is also a piece in the Riverview Residence Hall entitled Miss Thang Went to the Party. This piece represents the childhood memory of when she idolized her Aunt Doretha and big sister of a friend. She believed they were real life black Barbie dolls. But she realized that the two had more than physical beauty; they were also very smart and caring. The two young women brought various gifts of knowledge to the party, and she believes this teaches girls a crucial life lesson; that knowledge helps unlock true beauty. When asked about her inspiration for art, she says that life in general is an inspiration and the daily things that happen. Instead of reacting in a negative way, like a verbal or physical fight, Della will take bad situations out on art. When she is “pissed off,” she will create a piece about that to set her feelings free. Her collage work is inspired by Henri Matisse, and Romare Bearden, but some of Della’s favorite artists and inspirations are Pablo Picasso, Fred Stonehouse, and Rembrandt. Her work is in many public and private collections. Della is considered one of the leading African American folk artists at The Hurn Museum of Contemporary Folk Art. Ms. Wells is an award winning artist and has publications in Betty-Carol Sellen and Cynthia J. Johnason’s book, Self-Taught, Outsider, Folk Art Guide to American Artists, Locations and Resources. Della has a piece of work hanging in her studio that represents some of her feelings of life and love. This piece says “Yes, the world I live in is crazy. But I did not ask it to be that way. All I wanted was to be loved. That’s what all of us wants. But so many of us don’t even know what it’s like to be loved. Maybe for some of us it just wasn’t meant to be.” This statement is inspiring and heartfelt. Originally studying to receive a PhD in psychology, Della realized with the help of family and a college advisor that she wanted to be an artist at 42 years old. But, as a child, Della liked telling stories, creating motion pictures, making flash movies and drafting writing assignments to escape her mother’s mental illness of schizophrenia and her father’s sense of rage. She used to spend a lot of time looking back at her parents’ black and white photographs from the 1930s and 1940s. Della liked to make up her own realities, because she felt she had to. Her work stems from personal experiences. She still uses her childhood imaginations as inspiration for her collage work. Della is involved in her community. She is on the Board for the Wisconsin Designer Crafts Council and the Museum of Wisconsin Art. In 2001, Della founded ABEA, which stands for African-Americans Beginning to Educate Americans about African-American Art. The mission of ABEA is to “function as both an advocacy and educational group for African-American artists and art supporters dedicated to contributing to cultural enrichment by promoting and educating communities about African-American art and artists, and providing opportunities for all artists to work together for prosperity and growth.” Della started ABEA because of the complaints of how African Americans were being treated, how underappreciated African American art is, and how people do not really know the kind of work African Americans do. Della Wells’ life has inspired the First Stage Children’s Theater to create a play about her entitled Don’t Tell Me I Can’t Fly. It portrays the life of a nine-year-old girl, Tonia, who tries to adapt to her family’s lifestyle by seeking to contain her creativity and intelligence. Tonia uses her creativity through the difficult situation of her family. Her family soon sees her harnessed artistic soul, and begins to appreciate how the best thing a person can be is herself. This play is an inspiring and engaging look on Della’s family life, and how she grew into the person she is today because of her childhood. This play was selected to be read at the Kennedy Center’s 2010 New Visions/Voices Festival. Della Wells continues to be an inspiration to the community of Riverwest and to people all over the world with her unique mixed media pieces and diverse background. In the Fall of 2011, students from the UWM Art Living and Learning community began their “Notable Neighbors” project. 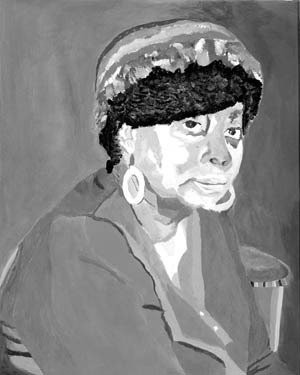 Each student interviewed a Riverwest community member, and painted a simple value study portrait. The portraits are to be enlarged to a maximum dimension of 53 inches, and installed on the wall along the Beer Line trail located at the top of the hill at the end of Meinecke St. All participants will be invited to help with the installation, and celebrate with a picnic afterwards. The enlarged images of the Notable Neighbors paintings will be affixed to the panels using wheat paste, which can easily be removed by powerwashing the wall when the project has run its course. The long-term vision suggests using this wall for art projects each year, subject to the city’s approval. Next year is the Year of the Arts at UWM, and the Peck School of the Arts will be sponsoring art all around Milwaukee during the fall of 2012 and Spring of 2013. Next month the Riverwest Currents will present another neighbor through the eyes and hands of UWM students. Take a hike down the Beerline Trail and look for the entire collection of paintings on the wall as you approach Riverview Hall.